Governor Gary R. Herbert, Lt. Governor Spencer Cox and a wide range of rural stakeholders met on Oct. 10, 2018, at Snow College in Richfield, to review individual county strategic economic development plans and state programs. 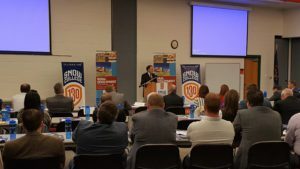 The conference was part of the Governor’s 25K Jobs Initiative, begun in 2017, and was attended by rural legislators, economic development directors, members of the Governor’s Rural Partnership Board, staff from the Governor’s Office of Economic Development (GOED) and others. Natalie Gochnour, director of the Kem C. Gardner Policy Institute, presented an analysis of rural county strategic economic development plans. The analysis incorporated highlights of individual county plans and opportunities for state-wide strategic growth and improvement. Governor Gary R. Herbert addressed the audience, acknowledging economic development challenges in rural Utah as well as opportunities for growth and needs for further infrastructure development. He noted the state’s progress on the goal of 25,000 jobs in rural Utah and said we’re ahead of schedule. He shared the story of a letter the Utah Office of Tourism received from some tourism workers in another state and how a recent discussion focused on the good experience many of them had visiting Utah and national parks located here. Gov. Herbert shared the economic successes and recent accolades Utah has received. GOED’s Office of Rural Development (ORD) released a comprehensive guide to the office’s eight key programs. ORD director, Linda Gillmor, discussed the programs and how to access the program guide and program applications online. Staff from the Kem C. Gardner Policy Institute facilitated four group discussions and report-outs to achieve a better understanding of ORD’s programs and to allow the audience to suggest possible improvements. Wrapping up the day’s activities, Lt. Governor Spencer J. Cox talked about the importance of pathways connecting workers to training and then to careers. He said, “We need lifelong learners prepared to work in the future economy.” He also noted the state’s excellent work bringing new companies and jobs to the state and proposed streamlining incentives while being selective about the types of companies Utah seeks out. He encouraged innovation that allows people to work where they are, saving companies money and supporting workers’ lifestyle choices. For more information on ORD, click here.